This article is about the character. For the guest star, see Marvin Hamlisch. Marvin Hamlisch is an American composer and conductor. Marvin Hamlisch was one of the speakers you can hire through the Springfield Speakers Bureau. After Bart performed at the Karaoke Before We Croak event at the Springfield Retirement Castle as Kenny Rogers, Milhouse came up on the stage and the old folks thought he was Marvin Hamlisch and started to admire him. Milhouse asked Bart to help him as the old people smelled like Ginger Ale, but he was too busy picking up the money that the old folks had thrown onto the stage. 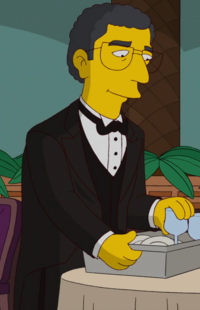 When Abe escaped from the Springfield Retirement Castle, Homer and Marge search his past and discover that he worked with Marvin Hamlisch in a local restaurant and that he fell in love with the restaurant's singer, Rita LaFleur. He died three months before his episode aired on August 6, 2012. Modified on January 22, 2015, at 23:35.